Delving into the world of the extremely small, researchers are exploring how biodegradable nanoparticles can precisely deliver anticancer drugs to attack neuroblastoma, an often-deadly children’s cancer. By bringing together experts in pediatric oncology with experts in nanotechnology, researchers at The Children’s Hospital of Philadelphia aim to thread the needle of delivering effective doses of cancer-killing agents while avoiding toxicity in healthy tissues. The team’s new research shows that this approach inhibits tumor growth and markedly prolongs survival in animal models. Brodeur’s group collaborated with a group of CHOP nanotechnology researchers led by Michael Chorny, Ph.D., in a study to be published in print May 1 in Cancer Letters. Chorny, in turn, led a study to be published in the May print issue ofBiomaterials, in collaboration with Brodeur’s group and with Robert Levy, M.D., and Ivan Alferiev, Ph.D., both members with Chorny of a cardiology research group at CHOP. That paper described how the team engineered the specially formulated nanoparticles. Neuroblastoma is a solid tumor of the peripheral nervous system, often appearing in a child’s abdomen or chest. The most common cancer in infants, neuroblastoma accounts for a disproportionate share of cancer deaths in children, with cure rates lagging behind those for most other pediatric cancers. Brodeur aims to translate these preclinical results to human trials within the next year. “We envision targeted delivery via nanoparticles as a fourth arm of targeted cancer therapy,” he said. Brodeur added that if nanoparticle delivery proves its worth in clinical trials, it may join three other molecularly-targeted innovations in pediatric cancer treatment already available at CHOP: immunotherapy using bioengineered T cells, radioactive isotopes that preferentially bind to cancer cells, and kinase inhibitors that interrupt abnormal signaling triggered by cancer-driving mutations. Funding for both studies came from the National Institutes of Health (grant CA094194), Alex’s Lemonade Stand Foundation, the V Foundation, and the Audrey E. Evans Endowed Chair of The Children’s Hospital of Philadelphia. Additional funding for the study by Alferiev et al came from NIH grant HL111118 and the William J. Rashkind Endowment of The Children’s Hospital of Philadelphia. 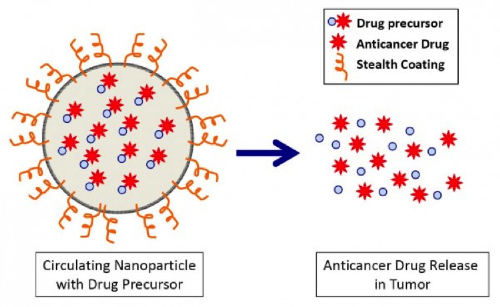 Nanoparticles May Exploit Tumor Weaknesses to Selectively Attack Cancers. Appl Rad Oncol.